The HighLighter® LED is a low-profile mini-lightbar that is ideal for a variety of applications including snowplows, landscaping, construction, and repair and service vehicles. 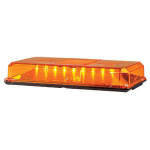 This mini-lightbar is dependable and offers continuous warning with fewer repairs and lot more time on the job. The HighLighter LED combines the high-performance of Federal Signal's patented ROC (Reliable Onboard Circuitry™) technology with the high-efficient design of the Solaris® LED reflector to provide a dependable 360-degrees of light output.